When I was an easily-bored teenager (is there any other kind? ), my friends and I called everything that bored us vanilla. "Oh, that's soooo vanilla" described anything from physics homework to piano lessons, to a hair style or lipstick color or having to babysit on a Saturday night. And what did we call people who bored us, the math teacher with the monotone voice, the boy who had a reputation as a bad kisser? We were so unkind. Vanilla deserved better. Native to Central America, and today cultivated in Mexico, Madagascar, Tahiti and Indonesia, vanilla is the fruit of a perennial orchid. When harvested, the pods have no aroma or flavor; those qualities come out during the drying-and-sweating process as the pods ferment. Contrary to everything I thought I knew when I was growing up, vanilla is neither the opposite of chocolate nor the absence of chocolate. In fact, the two tastes go hand-in-hand, because cacao beans often were ground together with vanilla beans, and our collective taste buds have come to prefer the slightly vanilla-ized taste of chocolate. 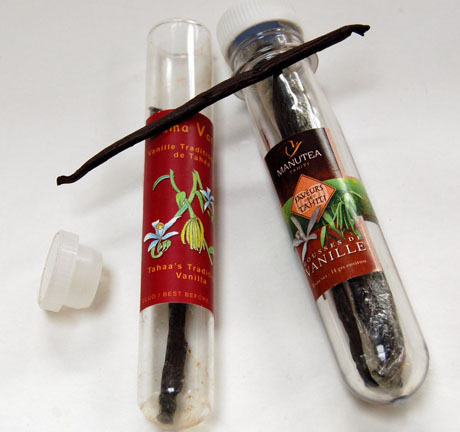 Store vanilla beans in an airtight container, away from light. They'll keep for two years or more, and can be used over and over; even if the beans have dried out, they often can be reconstituted in water, or ground to a powder and mixed into sugar. Five pounds of fresh pods will yield one pound of cured vanilla beans, best used in dishes like custards, ice cream and cakes, where the liquid in the recipe helps draw the flavor from the bean. Use them when you want your dish to look vanilla, in marionberry caramel swirl ice cream or cheesecake bars or marshmallows, or to taste vanilla, in mashed sweet potatoes or white asparagus soup. 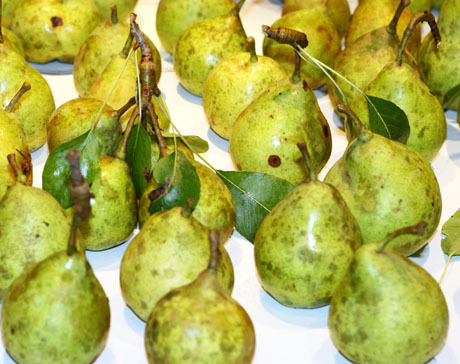 The pears in the photo, while clearly not poached, were harvested from our own pear trees. We don't spray, so they're not the most beautiful pears in the world, but we're inordinately proud of them. This recipe, which can be varied with the addition of ginger or saffron, serves 4. In a deep straight-sided, nonreactive saucepan, add the water, sugar, lemon zest, vanilla bean seeds and pod, and star anise and bring to a boil over high heat, stirring until sugar is completely dissolved. Peel the pears, leaving the stem intact. Slice off just enough of the bottom of each pear to create a flat, stable base. Reduce heat to keep poaching liquid at a bare simmer and add the pears, laying them on their sides. Gently turn the pears occasionally, and cook until they are just tender when pierced with a knife, about 6-9 minutes. Allow pears to cool completely in their poaching liquid. Stand each pear upright on a plate to serve, or transfer pears and poaching liquid to an airtight container and store in the refrigerator for up to 2 days. I was thinking about you the other day when I made poached pears with vanilla and saffron...reaching into my pantry I thought "ooh, Lydia would be so proud of me for combining both!!" Poached pears are one of my favorite desserts. I think those pears are gorgeous! And nothing, nothing smells better than a vanilla bean. Hehe... I used to say vanilla too! It really does deserve better - I mean, come on, vanilla beans sparkle, and how could that be boring! I agree -- those pears look gorgeous! The fact that they look real and from a real garden farm/adds to their beauty. If you have tahitian vanilla it's taking the aroma to a different plane -- It feels like the flavor expands in my mouth like eating cotton candy. I had a co-worker describe something as being "vanilla" just the other day. Vanilla beans are WAY up there on my favorite things list... and these poached pears sound wonderful! I have some vanilla beans in my cabinet for a couple of months now. I've been trying to figure out what to do with them... thanks for all of those great ideas! I can't wait to get started! We also always called boring "just plain vanilla." That came back to bite someone I knew: she had a recipe for something like chicken kabobs that required plain yogurt. She wasn't familiar with yogurt (back then, it was exotic) -- she picked up VANILLA yogurt instead of plain. OOPS. lol at your intro... so funny XD How lovely to have your own pear harvest! I have a soft spot in my heart for poached pears, as they are one of the easiest yet most elegant ways to round out a dinner. And to harvest pears like those from a tree in our yard, I would jump for joy, as there are no fruit bearing trees on our property. We just got 116lbs of pears from my mom's tree (also not sprayed). We canned them, dried them, made pear butter and pickled pears. I have a few left, perhaps they will be graced with my last vanilla bean. I'm not even sure I knew vanilla came from beans when I was a teenager, so good for you at least on that point! I am really wanting to poach some pears now. So, you say that saffron or ginger will be good additions, or good replacements of vanilla in this recipe? What does the star anise bring in terms of flavor? I had poached pears for the first time this year at a French restaurant. They make such an amazing dessert! I hate to admit it but I have been called "vanilla" myself- and only more recently appreciate how incredibly nuanced and aromatic it is. How wonderful to have all those pears and eat them perfumed with vanilla. Poached pears are one of those things I've never had and always wanted to. I bet they're delicious. For a woman who's not that into fruit, I do love pears. Is there any other kind of teenager?!? I remember when vanilla meant dull and boring and it is so anything but! The beans make so much difference. This is a lovely pairing with the pears! TW, thanks. We are so proud of our pears, though Mother Nature did all the work. Robin, gee, I thought my friends and I made that one up! Julia, I do have Tahitian vanilla, courtesy of my Cousin Martin who brought me a large stash of extract and beans from Tahiti a couple of years ago. Michelle, vanilla is way up on my list too, but never as high as chocolate. Patsy, hope this is the first of many recipes you'll make with your vanilla beans. Mae, I've done that, too -- mistaking vanilla yogurt for plain. Noobcook, we do love our pears. Sandie, I think poached pears are truly elegant, too. And I'm quite partial to fruit desserts. Susy, that's a lotta pears! Betty, funny you should say that, because my mother was not a baker, so now I'm wondering where I learned about vanilla beans. Nate, they are great additions to vanilla, and star anise just adds a bit of a bite. Star anise, vanilla and ginger together would be quite delicious, I think, though I've not tried it. Hillary, it's also a really easy dessert to make. Meeta, you're right, of course -- we were really unkind to vanilla! Callipygia, I hope that whoever called you vanilla meant it as a compliment, because it is such a wonderful flavor. Kalyn, poached pears are really simple, though they do taste best if made with a sugar syrup. Still, elegant and a great dessert for entertaining. MyKitchen, did you go to my high school?? I'm glad to know we're not the only ones who used that expression -- though I did think we were so clever and made it up! So great that you have great fruit and don't spray. I love vanilla - I just picked up a jar of vanilla paste - not quite sure what to do with it yet. I am only used to the extract and beans. call me vanilla... as I can eat this poached pear everyday! I used to think vanilla was boring too until I had my first vanilla bean. Hmmm...first Helne...now you...I think there is going to be a lot of vanilla poached pears on the web. I am so glad you are stepping up and giving vanilla the respect it deserves! Anything that is sooooo vanilla should be utterly fantastic! Natashya, you've got me singing along now! Thank you for that. Gattina, now that I'm grown up, I only use vanilla to describe people I really really like -- so of course I will call you vanilla! Maggie, I just used the last of the pears today, to make pear sauce and chutney. They were delicious this year. Patricia, so true. I can't imagine buying that imitation vanilla extract in the supermarket. Veron, aren't Helen's saffron pears beautiful? Mikky, I believe my home-grown pears taste better than anything I buy at the farmers' market. Whether it's true or not, that's what I believe! EB, yes, time to respect the vanilla bean! Your pears sound great, I love anything that involves vanilla beans. lol, calling people vanilla beans cracked me up. They cost a LOT less and the quality is excellent (and they shipped really quickly, too). I can't sing enough praises about them. I'm not sure if there's an ingredient in baking that is more significant than vanilla. Great post! Sara, it's a truly delicious and easy dessert. 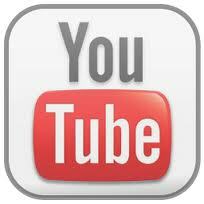 Mike, thanks so much for sharing your source! Ivonne, of course I'm partial to chocolate, but you can't have chocolate without a bit of vanilla for balance. So you might be right!